If you looked out across Lake Michigan on a summer evening, seeing two dozen or so paddleboarders and kayakers cruising along the coast wouldn’t faze you. Now, take that scene to the east-side canals of Detroit and add in a farm-fresh meal, and it might give you pause. But for Alex Howbert, it’s his vision come to life. Howbert took his mulled-over vision of a well-received river and brought it to reality through his company, Detroit River Sports, which launched Paddle to Table events late last summer. Held on seven select Saturdays and Sundays from June to October, the events begin with a two-hour, easygoing tour of the canals led by one of the company’s guides. Boarders pass by Klenk and Harbor Islands, Fox Creek, and Grayhaven, and view the Fisher Mansion and the downtown skyline at sunset. “You really feel like you’re not in the city, you’re out in the country somewhere, but … you’re right here in Detroit, and it’s a beautiful place to be out on the water.” Howbert says. 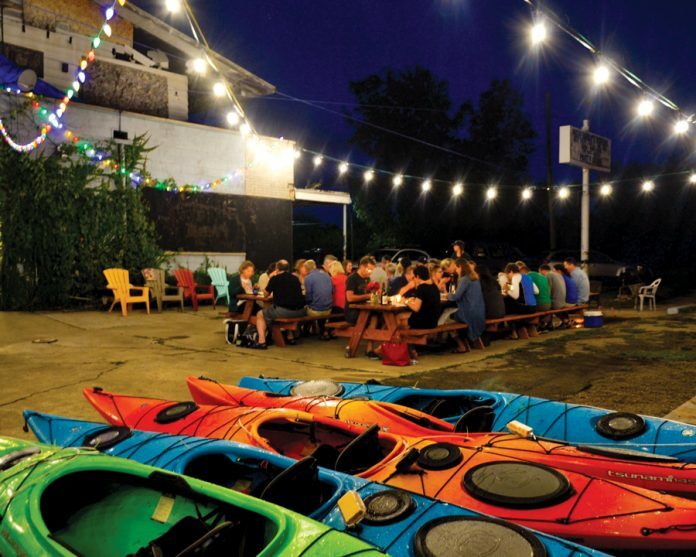 Paddle to Table provides more than views of the unseen and oft-forgotten patch of Detroit. At the end of the tour, participants gather at Fisherman’s Marina for a four-course meal prepared by Coriander Kitchen and Farm, a Detroit-based catering company and half-acre farm. Noticing the rise of private dining experiences, Howbert collaborated with Alison Heeres, co-owner of Coriander, to bring a waterside meal to the tour. Though Heeres and her business partner, Gwen Meyer, originally wanted the event to be located near their farm in the city’s McDougall-Hunt neighborhood, the duo discovered that the marina was the ideal spot for their style of food. The kitchen and farm’s dishes are unique to each event and the ingredients depend on seasonality. Last summer, Heeres prepared fresh pasta made with pork loins. The meals are often healthy and hearty, featuring grilled, Michigan pasture-raised meats from small local farms or Great Lakes-native fish, such as trout. There are also herb-heavy salads and farm-grown vegetables, which are served family style at picnic tables along the canal. Howbert’s brainchild has been drawing both tourists and locals, including couples looking to spice up date night. 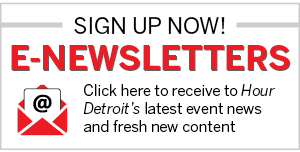 For more information, visit detroitriversports.com.